Be boring—in a good way! Follow this guide to take your DIY projects to the next level. A lot of crafty DIYers hit the glass ceiling when it comes to the material of the same name. You’d love to create a lamp from an empty wine bottle, say, or hook that mirror directly through a hole, but the thought of putting a drill to such fragile material stops you cold. Clearly, the time to upgrade your skill set is now. As long as you don’t attempt to bore through temperedor “safety” glass (identifiable by markings at the corner of the pane)—which will shatter upon applying mechanical force—all it takes is the correct drill bit and proper technique. Bits suitable for boring glass have spear-shaped carbide or diamond tips. Available at most hardware stores, these bits come in various sizes; consider getting a small one for “starter holes” and a larger one to suit the diameter of the finished opening you want to make. As to technique, be sure to maintain low speed and moderate pressure, and always wear goggles to protect your eyes from potentially airborne shards. Make an “X” with two pieces of painter’s or masking tape at the drill site. In the center of the “X,” use a felt-tip marker to indicate the precise spot where the hole will be. The tape will give your bit some traction and keep it from wandering on the otherwise slippery glass surface. Secure the glass object you’re working with. Lay panes of glass on a pad or other cushioning material. 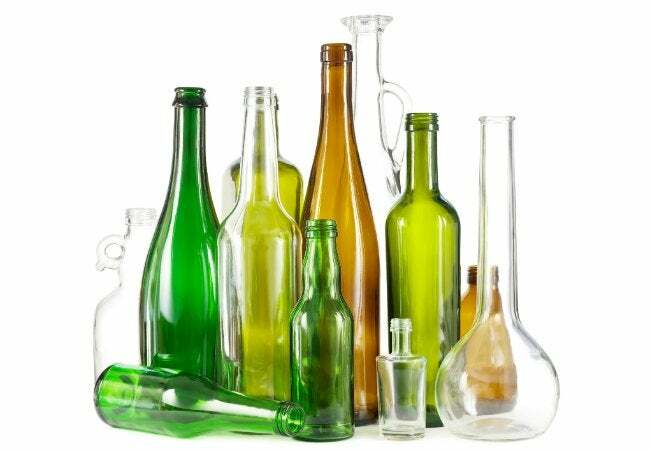 If you’re drilling into a glass bottle and find it easier to work on the object at a slight angle—say, 45 degrees—place the bottle on its side, with the marked drill site facing up, lift by the neck to the angle that feels comfortable and hold the neck to keep it from moving while you drill with the other hand. 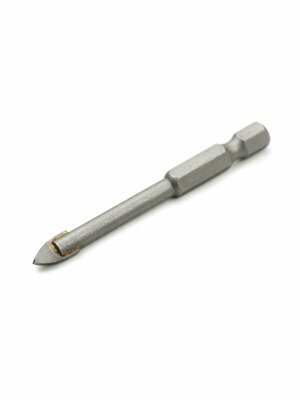 Insert a 1/8-inch or 3/32-inch carbide- or diamond-tipped bit into the chuck of a variable-speed drill. Small bits work best for creating a dimple or starter hole in the glass. Don your protective goggles and hold the drill at a right angle (90 degrees) to the glass surface. Begin drilling at a low speed—below 400 rpm—to carve the starter hole; remove the tape when that’s done. Replace the starter bit with a larger one if your project calls for a wider hole. Continue drilling at about 400 rpm, and apply light pressure on the drill so you won’t crack the glass. High-speed drilling causes overheating and glass-powder buildup at the drill site; it can also ruin the bit. While the entry hole will be generally clean and smooth, the edges of the exit hole might be sharp. Gently file down any chips or jaggedness with a 600-grit diamond file that fits into the hole. Rinse to remove all residual dust. Work on a few practice pieces till you get the hang of it, and soon you’ll be crafting with glass!